It’s a terrible pun, but The Wellbeing Of Women garden was the one to wow me at this year’s RHS Hampton Court Flower Show. I wasn’t alone: it won the prestigious People’s Choice in the Small Garden category. In contrast it ‘only’ received a silver-gilt award from the judges. That’s one step down from gold – not too dusty, you might think, though not what any designer really hopes for. But a silver-gilt combined with a People’s Choice award is a different beast. 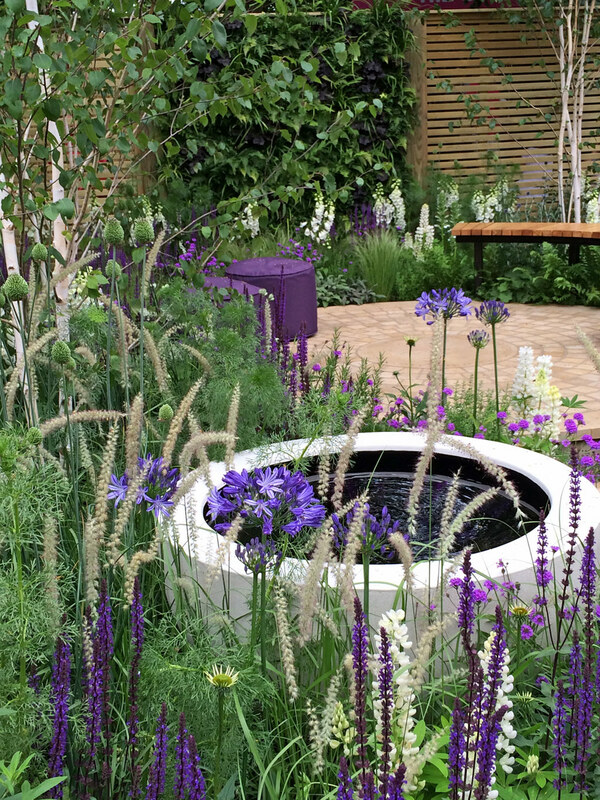 Those fatal flaws the judges spotted can take a back seat – when voting for RHS show gardens, British gardeners rarely get it wrong. I’m sitting down squarely behind the people rather than the gardening patricians when it comes to The Wellbeing of Women garden. Other reviewers mentioned feeling a sense of calm and relaxation. I’m sure that would have been my impression too if I’d not been peering at this garden through a crowd of admirers in such sweltering temperatures. We’d all enjoyed a rare leap second the day before and it seemed 1st July was determined not to let itself be upstaged that easily. Temperatures at the nearby Heathrow Airport soared to 36.7°C (98°F) making it the hottest July day in England since records began. Outside the show, commuters were listening open mouthed as a Network Rail spokesman blamed train delays on the wrong kind of metal (I suppose it does make a change from the nefarious activities of the wrong kind of snow, soil or leaves). The Wellbeing of Women garden did seem peaceful after that. Spiraling stepping stones created a sense of progression towards a seating area: each step etched to mark a decade of the charity’s history. 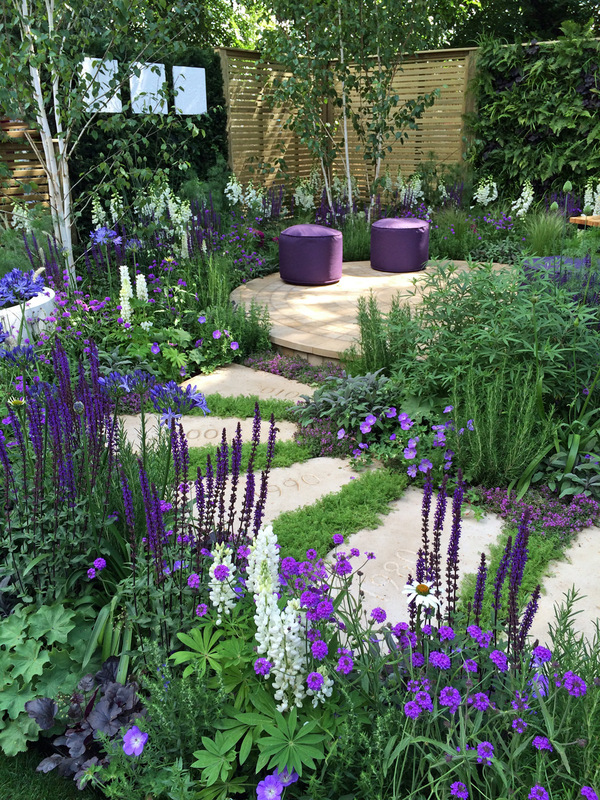 But it was the planting that made the garden stand out – a wide array of medicinal, aromatic and sensory plants in the charity’s colours of purple, blue and white. This list doesn’t tell the whole story: I spotted others including Geranium ‘Buxton’s Blue’, Alchemilla mollis, white lupin and a purple shrub rose – ‘Tuscany Superb’ or similar – and there were trees and ferns too. I can see surface print designers being inspired by the Wellbeing of Women garden – this was an outdoor space for those who are fascinated by texture and pattern. We’re often advised by experts to grow plants in small clumps of the same variety: look at the way most schematic garden designs are marked out. The loose, prairie planting style, fashionable over the last decade or so is usually interpreted in much the same way. Instead, imagine you’ve grown a wild flower meadow by sprinkling a large packet of mixed seeds evenly over raked earth. When the flowers bloom, the overall impression is of many delicate wildflowers beautifully mingled in together. Much the same effect can be created by interweaving cultivated plant varieties together as designers Wendy Von Buren, Amy Robertson and Claire Moreno had done in the Wellbeing of Women garden. It’s more dramatic and painterly, while remaining ethereal. I love this style of intermingled drift planting. It makes the more clumpy style of planting in small groups of the same variety look positively old fashioned. It’s strikingly effective at flower shows where many of the plants are relatively young, but I’m not convinced this pristine, evenly-blended, tapestry effect would survive long term in a ‘real’ garden without active human intervention. Agapanthus foliage decays messily. Plants grow at different speeds and compete for nutrients and sunlight. But most show gardens are dismantled after just a few days, making what happens next? a non-issue. Do I mind that this might mislead or is not natural? Not at all. 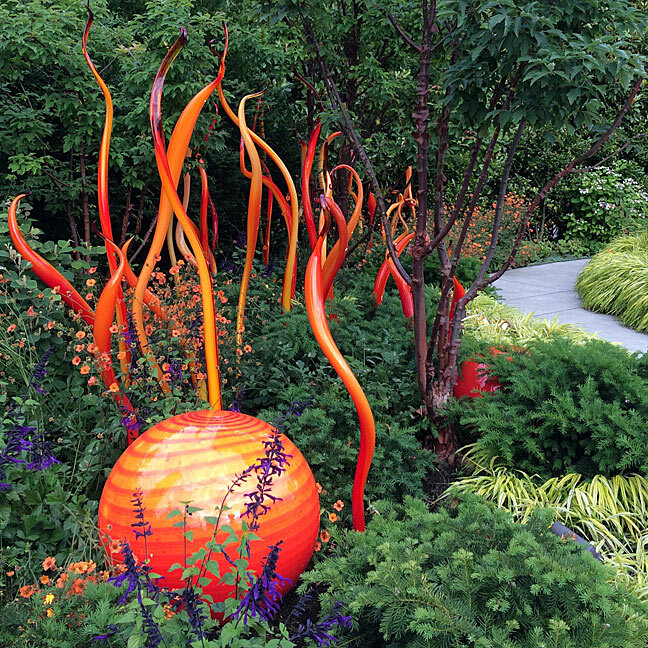 A show garden is a form of art. It’s there to inspire, enchant and move us to consider new ideas. The temporary Wellbeing of Women garden will keep its perfect form in my memory. I’ll remember how the stone was beautifully broken up by decorative, linear flower spikes and tall, round agapanthus; how scented creeping thyme and chamomile surrounded each stepping stone; how striking the white flowers were against the bold purples and rich blues; how a slight breeze kept the grasses and flower spikes constantly quivering with life. I’m a big fan of biodiversity in smaller spaces: it appeals to the plant nerd in me, and has a practical purpose. A wider range of flowering plants will attract different pollinators. It’s a well-known fact that disease-prone plants such as roses thrive in the healthy eco-system created when we surround them with companion plants rather than other roses. If one variety of plant starts to smother the others and needs to be moved or split – oh, well! That’s what we call gardening, isn’t it? The Wellbeing of Women garden was designed to help raise awareness for the charity, which has helped drive some remarkable scientific advances during its 50 year history. You can find out more about the charity’s aims and activities on their website. 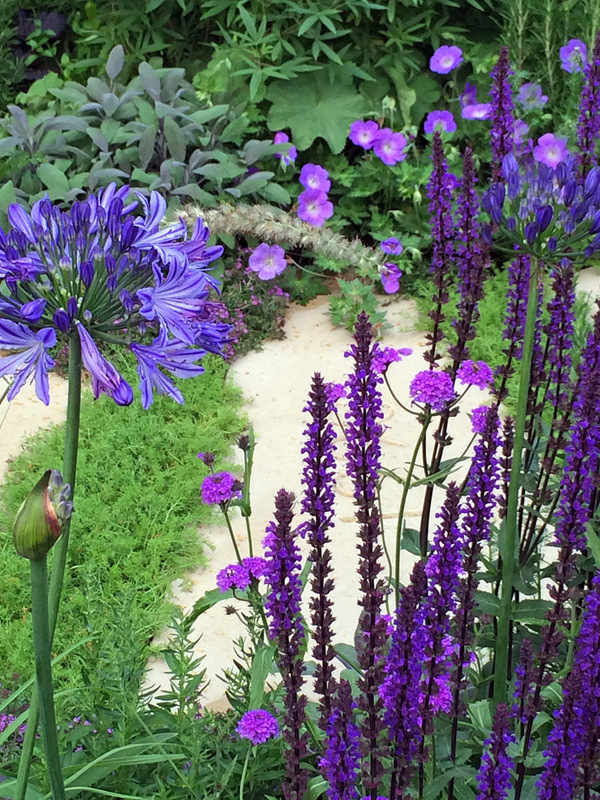 If you didn’t get chance to visit Hampton Court, you might enjoy Stephanie Mahon’s round up, published in The English Garden. I smiled at her observation that all her picks were silver gilt winners! For more about the Wellbeing of Women garden, check out the RHS website. I love the color purple in a yard; this is beautiful. Gorgeous photos accompanying a very interesting and well-written article. 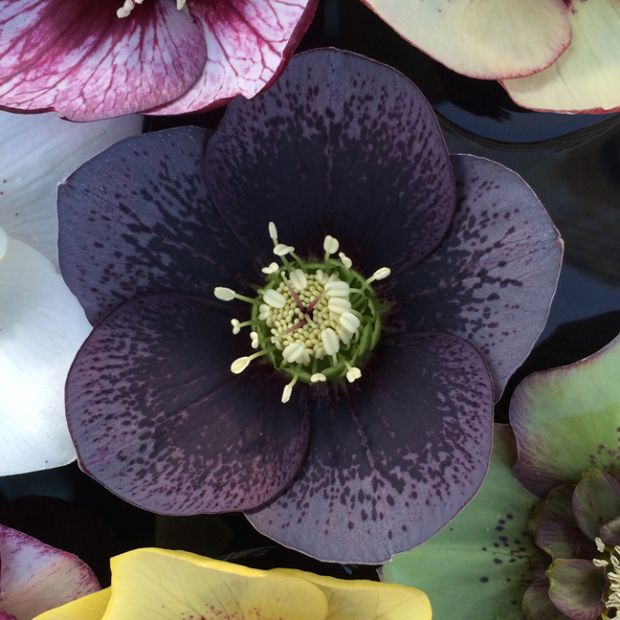 Thanks – there is always plenty to provoke thought and delight the eye at a flower show. Lovely photos. A favorite image for. I think of a goddess sprinkling life and love and dreams fulfilled. I enjoyed reading this, thanks, and of course looking at those beautiful pictures. They leap off the screen. Such colour and depth. To see it all in person would be such a delight. It was the highlight of the show that year for me, but the great thing about flower shows is that there is something for everyone.